Hello and welcome to our live coverage of the 34th Clásica de Almería. Today's race runs 192.5km from Almeria, on Spain's south coast in Andalusia, to Roquetas de Mar, which lies just down the coast. We're around 15 minutes until the peloton set off, and it's climbing from the off in the 192.5km race. Multiple hills dot the first half of the route, before a long descent and the anticipated sprint finish later on this afternoon. Caleb Ewan (Lotto-Soudal) was the winner here last year, while Mark Cavendish (Dimension Data), Sam Bennett (Bora-Hansgrohe) and Michael Matthews (Team Sunweb) have also triumphed here in the past. None of those men will be racing today, however. But look out for the likes of Matteo Trentin (Mitchelton-Scott), Marcel Kittel (Katusha-Alpecin) and Pascal Ackermann (Bora-Hansgrohe) – they're among the favourites for the win in what is likely to be a sprint finish. There are four climbs and four intermediate sprint points along the way, so something for the inevitable breakaway to fight over. The toughest climb of the day is the last one – the second category Alto de Turrillas, which comes at the midway point of the race. And we're off! The race has just gotten underway. No word on any breakaway at the moment. Christophe Laporte (Cofidis) was due to race here today, but is suffering from sinusitis and was replaced at the start by Mathias Le Turnier. Laporte has enjoyed a strong start to the season. Last week, at his first race of the year, he won two stages, the points classification and the overall title at the Etoile de Bessèges. After 10km of racing there are seven riders up the road. They have around two minutes advantage on the peloton. More on the names as we get them. Here's the composition of the breakaway – Carlos Verona (Movistar), Juan Antonio López-Cózar (Euskadi-Murias), Axel Journiaux (Direct Énergie), Justin Timmermans (Roompot-Charles), Petr Rikunov (Gazprom-Rusvelo), Jetse Bol (Burgos-BH) and Emerson Oronte (Rally UHC). There are three minutes from the break back to the peloton now. Almost four minutes for the break now. Verona is certainly the most well-known rider out there. Last year, in his final season at Mitchelton-Scott, he won the mountain classifications at the Vuelta al País Vasco and Tour des Fjords, and also finished second at the GP Miguel Indurain. The break is edging closer to the first intermediate sprint of the day at Tabernas. Their advantage is up to four minutes now. Strangely, Emerson Oronte has dropped back from the break after a chat with his team car. Journiaux took the first intermediate sprint of the day ahead of Bol and López-Cózar. We're not far from the first climb of the day, the third category Alto de Cuesta Blanca. Katusha-Alpecin are working at the head of the peloton. The break covered the 39km in the first hour of the race. The break covered the 35km in the first hour of the race. Over the top of the Alto de Cuesta Blanca and it's Verona leading from López-Cózar and Bol. The next intermediate sprint isn't far away either. The break are around 5km away from it. The gap to the six-man break is stable at around 3:30. As with the first sprint of the day, Journiaux and Bol take the first two places once again over the second. Timmermans is third this time, though. Now around 10km of flat roads before a 10km descent. After that, the road starts climbing again on the way to the three other categorised climbs of the day. The next climb is the fourth category Collado de Lucainena in around 30km. The gap is fluctuating between around 3:25 and 3:45 at the moment. There's still a long way to go, so there's no danger of being caught for the breakaway. The riders are currently around ten minutes slower than the slowest schedule as noted in the roadbook (39km/h). Should they keep this up to the finish, we'd be looking at a finish time of around 6:30pm local (5:30pm GMT). Astana and Caja Rural are among the teams at the head of the peloton at the moment. The break have reached the feed zone. Their gap remains at the 3:30 mark. The gap has come down a bit as everyone goes through the feed zone. Now the break is 3:15 up the road. The break are still all together with just over 100km left to race. Three climbs are on the way in quick succession, with the fourth category Alto de Lucainena up soon. Verona led over the top of the climb, ahead of Timmermans ans Journiaux. The third category climb of the Balcón de Sierra Alhamilla is up in a few kilometres. And over the top of the Balcón de Sierra Alhamilla it's Verona taking the points once again. Journiaux and López-Cózar are next over the line. Verona got away from his breakmates on the last climb and already has a minute on them, while the peloton lay 2:20 behind the Movistar man. Mitchelton-Scott lead the peloton. Up in the break it Timmermans who loses contact first. Over in the other race going on right now, the Trofeo Laigueglia, Simone Velasco (Neri Sottoli-Selle Italia) is soloing into the final 4km with a 25-second gap on Giulio Ciccone (Italy), while multiple riders scattered further back. 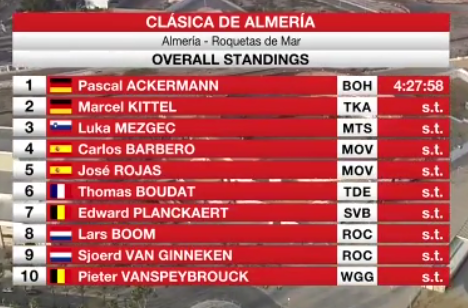 Meanwhile back in Almeria, Timmermans is caught by the peloton. The rest of the break are just 40 seconds up, while Verona's advantage is 2:20. Verona takes the final climb of the day, the second category Alto de Turrillas. Rikunov and Journiaux are second and third over the line. That result confirms Verona as the victor of the mountain classification, so long as he completes the race. There are still two intermediate sprints left, too. If Verona stays out front to win both of those (the last one is 42km from the finish), he'll be level with Journiaux in that competition. Not really sure what the tiebreaker is there. The split peloton absorbs the remains of the break, leaving Verona out there alone. Only 10 seconds separates the smaller lead peloton with the second group though, so they will come together again soon. Over in Laigueglia, Velasco takes a solo win! It's the first career victory for the 23 year old. Nicola Bagioli (Nippo Vini Fantini Faizanè) and Matteo Sobrero (Italy) fill out the podium. While we're on the subject, here's a quick roundup of the other races that have been run today. John Degenkolb (Trek-Segafredo) won the final stage of the Tour de La Provence from a small bunch sprint. Gorka Izagirre (Astana) secured the overall victory a week after his brother Ion did the same at the Volta a la Comunitat Valenciana. At the Tour of Oman, Alexey Lutsenko (Astana) took the win on stage 2 after a late solo attack. Alexander Kristoff (UAE Team Emirates) retained the race lead. And as we've just heard, Simone Velasco (Neri Sottoli-Selle Italia-KTM) triumphed at the Trofeo Laigueglia after riding solo for over 40km. Finally, over in Bricocross, Mathieu van der Poel (Corendon-Circus) and Denise Betsema (Marlux-Bingoal) won the men's and women's races respetively. Back to Almería and Verona has now been caught, with a big acceleration from the split peloton hastening his time out front. A group of around 30 riders leads the remainder of the peloton by 20 seconds. Mitchelton-Scott are on the front of the first group. Most of their team is up there, including –crucially – their sprinter Matteo Trentin. Marcel Kittel (Katusha-Alpecin), José Joaquin Rojas (Movistar), Pascal Ackermann and Jean-Pierre Drucker (both Bora-Hansgrohe) are also in there, so no big-name fastmen in the second group. Bora, Mitchelton and Katusha all having their sprinters in that front group is a blow to the chasers, who are now 40 seconds back as the next intermediate sprint looms. Journiaux and Bol take first and second over the penultimate intermediate sprint, the same result as the first two. Mathieu Burgaudeau (Direct Énergie) takes third. There are still around 40 seconds between the two pelotons. Both Katusha-Alpecin and Mitchelton-Scott are working at the front of the lead group now, and the gap is edging out. It's not at 50 seconds. The riders will soon pass through Almería and the final intermediate sprint of the day before heading west along the coastal road to Roquetas del Mar. The leaders have passed through the intermediate sprint and their advantage is now over a minute. Journiaux took the final intermediate sprint from Jack Bauer and Luka Mezgec (both Mitchelton-Scott). That confirms Journiaux as the winner of the intermediate sprint competition. Carlos Verona (Movistar) has already secured the mountain classification. The gap between the lead group and chasers is up to 1:25 now. It looks like the lead group is out there for good now, with their advantage only increasing. A small group has attacked from the chasing peloton, though. Mitchelton-Scott and Katusha-Alpecin are still driving it at the head of the lead group, which is unsurprising given the sprinters at their disposal. The Australian squad have Edoardo Affini, Jack Bauer, Luka Mezgec, Callum Scotson, Dion Smith up there with Trentin, while Katusha have Marco Haller and Simon Špilak working for Marcel Kittel. Bora-Hansgrohe, meanwhile, boast Maciej Bodnar, Jempy Drucker, Patrick Konrad along with their fastman Pascal Ackermann. Omar Fraile (Astana) has suffered a puncture and is dropped from the lead group. Fraile is fighting to get back, but he's 47 seconds down on the leaders and drifting. The riders are passing through countryside plastered with white plastic greenhouses, where fruit and vegetables are grown en masse. The bird's eye Google Maps images are quite something to behold. Back to the race and there's 17km to run for the leaders, who are 50 seconds up on Fraile. Into the final 15km now and the situation remains the same. Let's just hope no disasters befall any of the sprinters so we can have a real showdown at the finish. Mitchelton-Scott are still leading the group, as they have been for a large portion of the day. Two laps of this finishing circuit to go, as the leaders pass through the finish line for the first time. A small chase group passes through the finish over a minute behind the leaders. Into the final 10km now. The lead group is lined out. The finishing circuit isn't particularly technical, and in any case the riders get a few previews on these laps. Here's a map showing the circuit. If it wasn't clear already, we'll be looking at a sprint finish from the lead group at the end of this final lap. The chasers are well out of the picture. Fraile's group passes the line over a minute back. Meanwhile, the remains of the peloton didn't cross the line on the last lap – their race is over. Still it's Mitchelton-Scott driving it at the front, though a Bora-Hansgrohe train is emerging up the side of the group. Katusha-Alpecin are still up there too. Now Bora take it up on the front as the sprint finish edges closer. As we enter the final kilometre it's Bora-Hansgrohe and Mitchelton-Scott with two competing trains up front. Katusha lie behind the Mitchelton train. Trentin is second wheel heading into the final 500 metres. Trentin was leading it out but Ackermann takes over with Kittel on his wheel! And it's Ackermann who holds on from the fast finishing Kittel to grab the win! Looks like it was Mezgec for Mitchelton-Scott in third. The Movistar duo of Carlos Barbero and José Joaquín Rojas took fourth and fifth. As for the minor awards, Carlos Verona (Movistar) won the mountain classification, and Axel Journiaux (Direct Énergie) took the intermediate sprints classification. Petr Rikunov was the best-placed man from the break today. The Russian finished 16th. It's Ackermann's first win of 2019 and his first ever win on Spanish soil. Kittel already has his first of the year, of course, having won the Trofeo Palma at the start of the month. Ackermann will ride his first Grand Tour this year. The German champion is down for the Giro d'Italia, where he'll be the leader for the sprints. In the near future though, he's heading to the Volta ao Algarve next week, before riding Omloop Het Nieuwsblad and Kuurne-Brussel-Kuurne at the start of March. The likes of Arnaud Démare (Groupama-FDJ), John Degenkolb (Trek-Segafredo) Edvald Boasson Hagen (Dimension Data) and Christophe Laporte (Cofidis) will provide some tough competition in Algarve. Some quotes from race winner Ackermann after the finish. "It was a really hard race. Actually 100km before the finish there was a split in the peloton. Mitchelton did it and then we came to the finish line and the sprint was a hard one. "No [I wasn't surprised that Trentin didn't sprint]. I saw it in the race that Trentin was going to the front and the other one was in the pack and I knew that Mezgec was going for the sprint. "It's good for the head to win really early in the season. I'm very happy for the victory and we can look forward to Algarve next week." This victory could be the start of a big year for Ackermann after bursting onto the sprint scene in 2018, his second as a pro with Bora-Hansgrohe. A promising start saw him podium at several Belgian classics including Driedaagse Brugge - De Panne and Scheldeprijs, before taking his first WorldTour win at the Tour de Romandie. Things only got better from there, with victories at the Critérium du Dauphiné, German National Championships and Prudential RideLondon-Surrey Classic following. He'd end the season with two wins at the Tour de Pologne as well as taking the Brussels Cycling Classic, GP Fourmies and a stage of the Tour of Guangxi. So ten wins, including six at WorldTour level in 2018 for Ackermann, and there's room to improve for the 25 year old. He'll be one to watch this season. That's all from us today. See you next week for more live coverage!